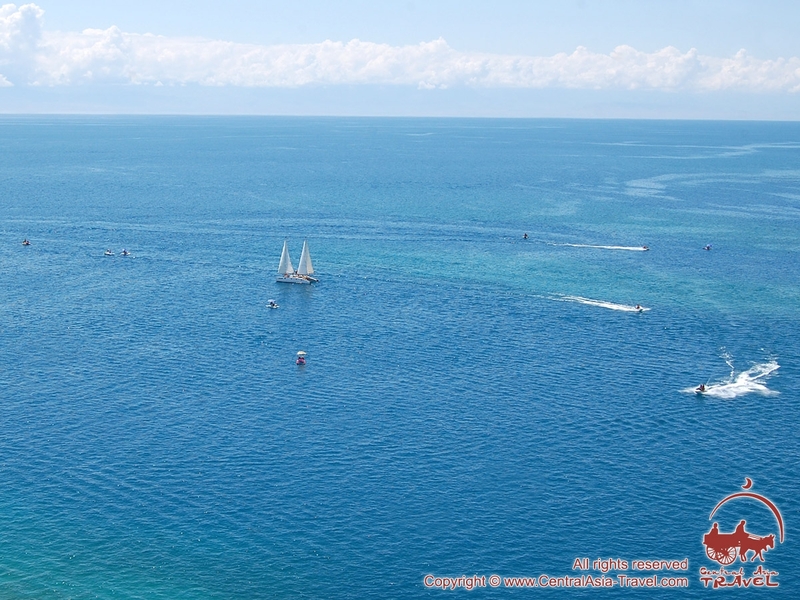 The Turkic for Issyk-Kul means ‘Warm Lake’. It was given this name because it never freezes over. The Chinese noticed the fact as long ago as the 1st с BCE, naming the lake Ze-Hi, meaning the same, and - either because of their love for poetry or disagreement - Tien-Chi (‘full lake’) and Yang-Hi (‘salty lake’). The Buddhist monk Xuanzang (Hsuan-tsang), who lived and preached in the 7th с CE, was lucky to see even dragons in the lake, which he reported in his chronicle. In his work Hudud al-Alam (‘The Limits of the World’) an unknown Persian geographer of the 10th с was the first to use the name Issyk-Kul and it has got stuck to the lake - the Pearl of Kyrgyzstan the lake is often nicknamed. 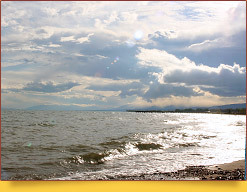 There is an amazingly large number of Issyk-Kul creation legends. According to one of them, the beautiful lake was a fair punishment a sleazy khan got for his desire for a beautiful girl whose heart belonged to a jiguit ‘strapping lad’ the girl had been to the sky with on his winged steed once in the morning. She did not know who he was but she had already been in love with him. Some young girls are like this: once you approach her on a flying steed, tell her some tales, kiss her all over - and she is all yours; and she needs no money - just let her feast her eyes on her beloved. Right, why should she want to be with a khan and his immeasurable riches when she has got a jiguit on Tulpar (Pegasus’s counterpart)? And the fact that the jiguit has visited her only once does not matter, since she is in LOVE. Besides, he gave her a ring, saying that misfortunes would pass by her and she would have a lot of power with her if she kept wearing it - and was gone. However, the sleazy khan managed to kidnap her because she had lost the ring on her way to the mountains where she had wanted to ask her beloved to help her resist the khan. When she discovered the ring was missing, she went back to find it - and here the khan’s lackeys grabbed her and took to the palace. 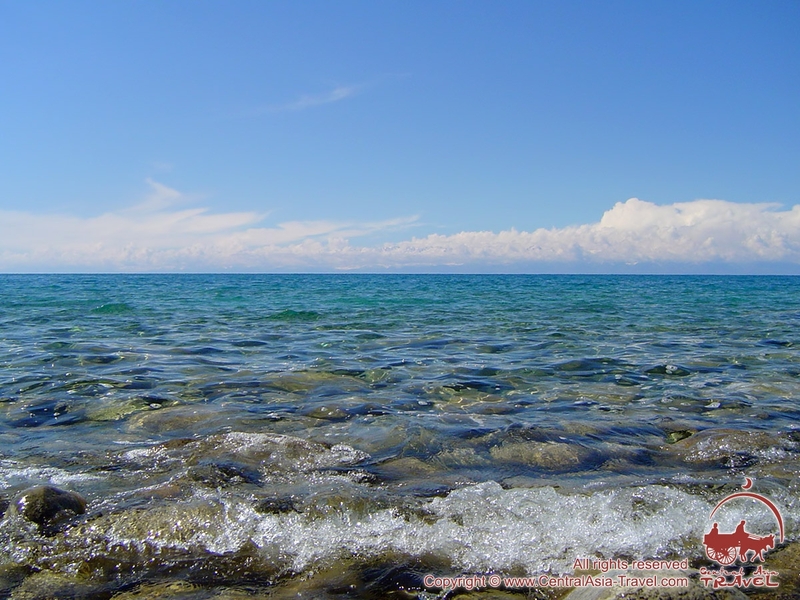 Obviously, the girl threw herself from of the window when the khan decided to take by force what he had not been able to get through gifts, and the khan’s palace was flooded with crystal clear water - the water of Lake Issyk-Kul, which is a holidaymaker’s bliss now. Another legend says that another khan had a beautiful wife - young and, for some reason, nimble-footed like a gazelle. Her name was Sumburun. Obviously, the khan was crazy about his wife’s nimbleness and moon-face beauty. However, the young beauty had no interest in her old husband… It happened 250,000 moons ago. Against sharia law (religious law of Islam) the young woman fell in love with a young Mongolian officer named Ay-Bulak, and never resisted her passion. When the khan discovered the fact, he prayed for 12 moons, shed certain amount of tears and, sobbing, put his dear Sumburun into a barrel, sealed it up with tar, tied a sinker of an 18-kilo golden ingot to it and threw them into a mountain lake. Since the the lake has been called Issyk-Kul, since the khan shed a lot of hot tears over his wife (and probably over the ingot as well). Another interesting version of the lake’s origin is the following legend. Once there lived a ruler named Ossoun. He was not an unusual human being, except that he had donkey ears giving away his mysterious origin. He hid them under various head garments, and killed every barber who cut his hair. He killed them all but one who spread the word about the ruler’s ears. And once he had done so, water gushed from everywhere and flooded everything and everybody in the settlement - the ruler, the barber and those who had not even heard of the donkey ears. The settlement is still there underwater - on the bottom of Issyk-Kul. 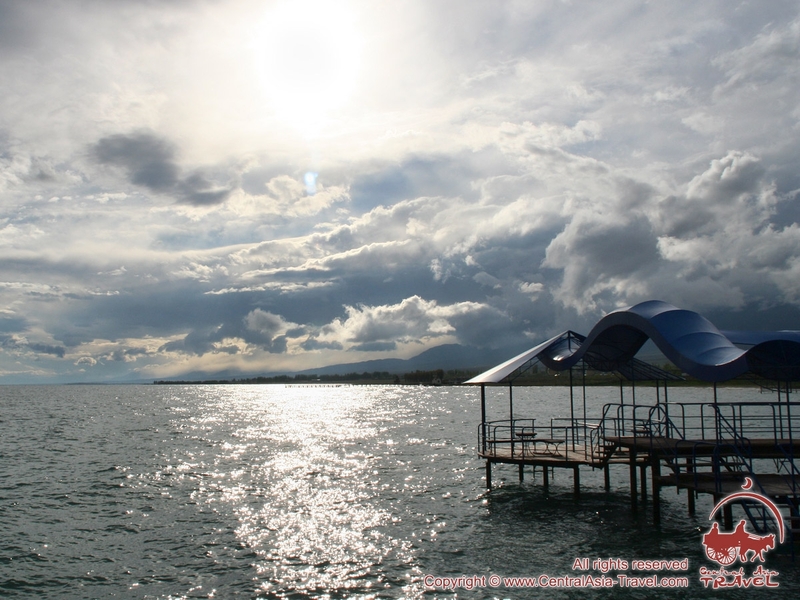 Besides fairy stories of love, lust, gold and donkey ears, there is certainly a number of more or less historically proven facts on the lake. 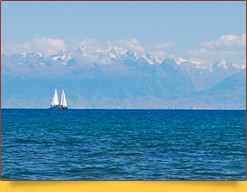 Issyk-Kul was the setting of the famous story about Tamerlane and a mountain of stones. Setting out on one of his military campaigns, Tamerlane came to the shore of the lake and ordered each of his warrior to take a stone and threw it to the same place there to build a mountain of them. While his troops were returning home, he ordered each warrior to take a stone from the mountain and put it nearby to form another mountain so as to know how many men were left. And the other mountain saddened him, since it was smaller. The mountain of stones has been there since then. 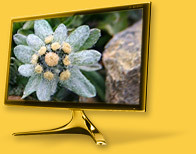 They named it Santash, meaning ‘counting stones’. It is the name of a mountain pass a little east of Issyk-Kul. Alexander the Great, having conquered the Persian Kingdom in 334 - 329 BCE, took hostages from the local families to prevent resistance. Setting out on military campaign in China and India, he took the hostages with him, but because of certain circumstances he had to leave these noble Persians at the shore of Lake Issyk-Kul. The sons of Persians aristocrats lost their hope of getting back home and built a village for themselves, naming it Barskhan. According to the book of the administrator of the town of Prejevalsk lying on Lake Issyk-Kul, there is proof the area was the center of Eurasia once. A flourishing town of it was flooded during an unprecedented disaster, and in calm weather its walls and structures can be made out in the waters of the lake. 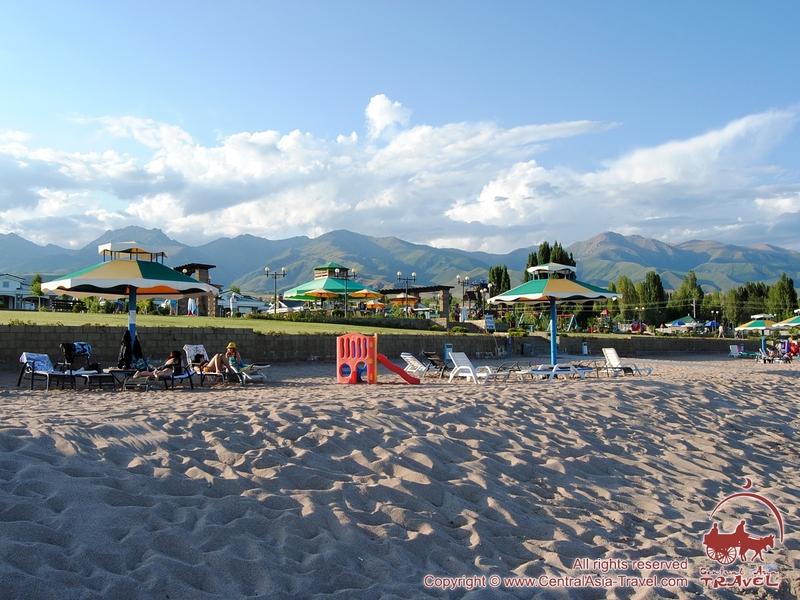 And it is not an only town on the bottom of Issyk-Kul. Archeologists say there are at least 10 ancient towns on the bottom, not to mention a number of monasteries. The local aqsaqal ‘respected elders’ assert that Genghis Khan himself was buried at Issyk-Kul. When the great conqueror was fatally wounded during the siege of the capital of the Tanguts in 1227, his sons imitated his funeral in Ordos, Mongolia, while secretly sent his body to Issyk-Kul. There under the direction of Chagathai, the ruler of Issyk-Kul province and Genghis Khan’s favorite grandson, they made a large coffin from super-tough Turkestan juniper, put the body with burial treasure into it, and buried it in the deeps of the lake. This Kyrgyz legend should not be completely ignored as a version, since Genghis Khan grave has not yet been found, with so many mounds in Mongolia having been shoveled up.